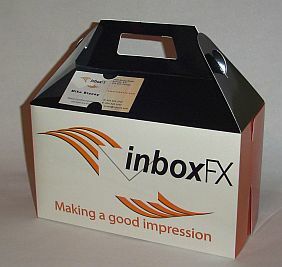 This Box is ideal for waiting rooms & front desks. Leave treats for everyone while giving you the opportunity to get your message across and leave your business card behind. Perfect size to hold mints, small hard candy or a 12oz beverage can. Also, the hole at the top will make this the complete birthday balloon anchor weight. Great for small hard candies, mints & animal crackers. On a sales call, this is ideal for a small leave behind. Call me at 800-568-8338 for more information or to order your new Silent Salesman. Everybody loves getting fresh donuts in the morning and delivering them in your custom donut box is a great way to capture new clients and solidify existing relationships. Sales reps are already taking in food on their sales calls. Does it make sense for them to drop off donuts in a box that says “Joe’s Donut Shop” or a custom made branding tool designed specifically for their company? It’s kinda obvious isn’t it? 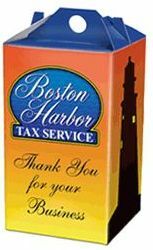 Clients have used Thanks A Dozen® custom donut boxes for sales visits, golf outings, fund raisers, trade shows and more. Our custom donut boxes are also great for “Lunch and Learn” Programs which give sales reps a captive audience without the typical distractions in a restaurant or food service setting. The success of any business depends upon developing and nurturing relationships…using Thanks A Dozen® products takes care of it one bite at a time. * A one-time set-up fee of $ 75.00 is required and shipping is extra. I am a distributor for an amazing company called Thanks a Dozen. 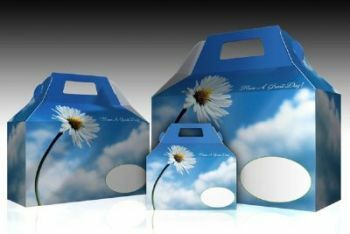 At first glance you might think they are a printing company specializing in printing donut boxes, but they are far more than a donut box company. 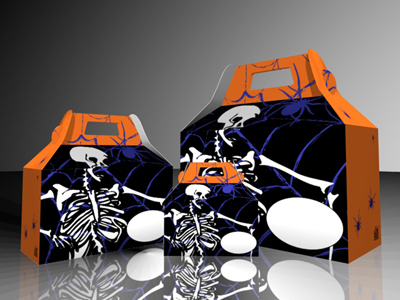 They are leaders in promotional packaging. This company has created the most effective packaging for a wide range of uses. 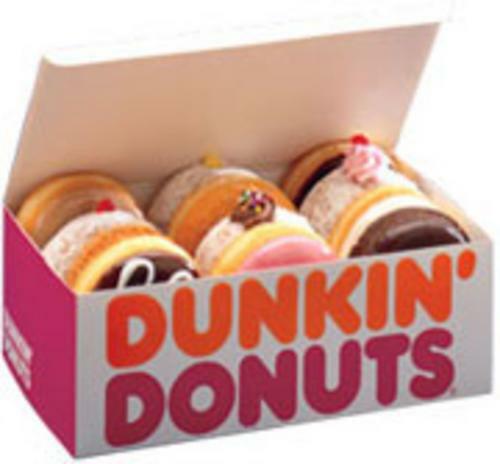 For reference purposes the size of boxes they print are referred to as donut boxes, bagel boxes, pizza boxes, cookie boxes, candy boxes and tissue box sleeves and they work well in these capacities, but pardon the pun, you need to think outside of the box. 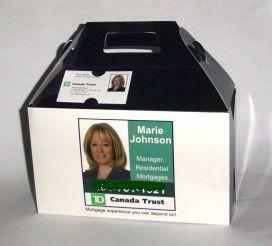 Virtually any business or service can now have a custom box to extend their brand farther than normal. After all who keeps a bag? I think it would be great to deliver a proposal to a client in a branded pizza box. A jewelry store could send that special piece home in a branded box. 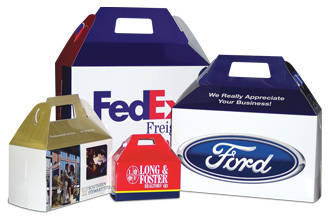 A branded box is perfect for dropping off samples to a prospect. Realtors can deliver a thank you gift in a branded box. 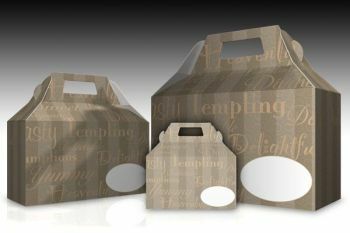 A deli can pack picnic lunches into a branded box. 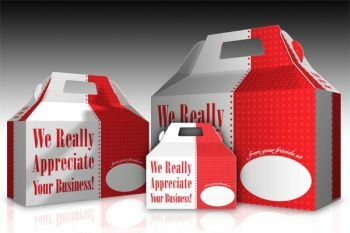 We can custom design, four color, gloss finished box prices start at $ 1.19 and range up to $ 3.39 for a larger box. If you think your business could benefit from branded packaging please call Mike Blaney at 800-568-8338 or email me at marketingguy@shaw.ca. 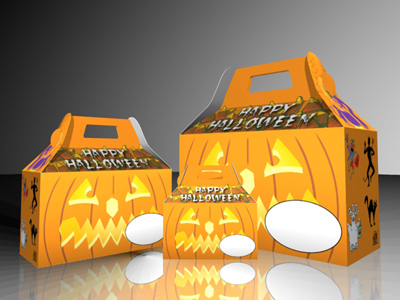 Halloween is one of the bigger holiday events of the year and a great time to take treats to clients and prospects. 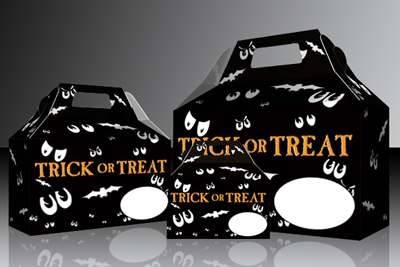 If you want to make a great, lasting impression you need to deliver treats in a customized donut, candy or cookie box. Call me at 800-568-8338 for more information or to place your order. 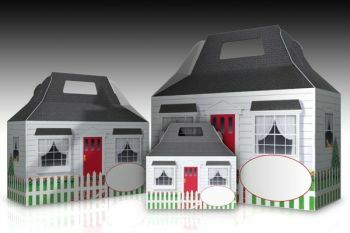 Best of all you can add your contact information and marketing message to the white oval and on the donut and cookie box attach a card to the roof. 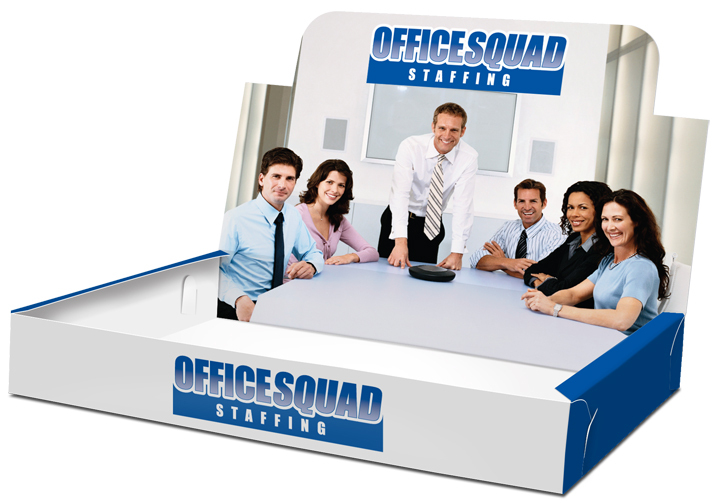 Dimensions:10″ x 4 3/8″ x 5 7/8″ plus roof – does include business card slot. 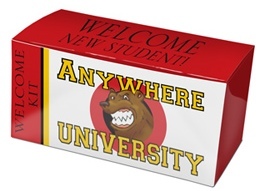 Dimensions: 6 3/8″ x 3 3/8″ x 3 7/8″ plus roof – does include business card slot. Dimensions: 4 3/8″ x 1 7/8″ x 2 1/2″ plus roof – does not include business card slot. Orders must be placed by October 12th to ensure delivery. Call for pricing larger quantities. Email me at marketingguy@shaw.ca or call Mike Blaney at 800-568-8338 for more information. How many times have you taken donuts into an office only to have the receptionist take them to the coffee room and the only person who knows you brought them is the receptionist? Have you ever taken donuts to a meeting, had half of them left over only to have the box taken away to be eaten by people who don’t know you brought them? 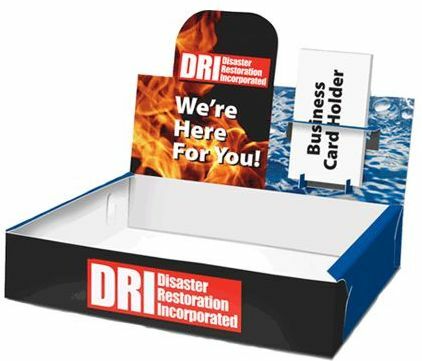 You can try taping your business card to the box, but that looks a bit tacky and they may take the top of the box off and your business card can’t be seen. Or you can order donut boxes that guarantee everyone will know who brought them. How? Simply go to Thanks a Dozen and start taking credit where credit is due. A while back I wrote about a great promotional tool from Thanks a Dozen and as a marketing guy I sent away for my free samples never thinking I would not only receive them, but that I would be so impressed. Are Donuts a Big Deal? 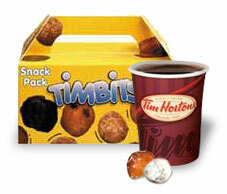 Here in Canada one of the leading chains is Tim Horton’s. To put donut consumption in Canada into perspective Tim Hortons has ten times the franchise penetration in Canada per thousand people than that of Dunkin’ Donuts’ in the US. There are a reported 10 billion donuts consumed in the United States each year and Canada is one-tenth the size, so Canadians eat 1 billion donuts, but with 10 times the penetration of franchises I wonder if we eat 10 billion? But we are off the topic. Foodsafe box is perfect for piping hot ready to serve pizza! Can I Customize the boxes? Yes. We will do that for you. Here are a few samples. Do you have stock boxes? Yes. Call me at 800-568-8338 and I can email you a brochure . 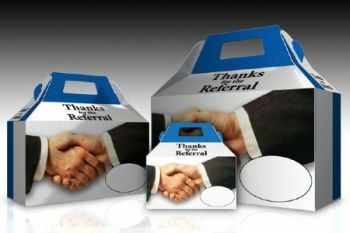 A great product for those in any business who depend upon the referrals of others. Available in a yellow version as well. Comes with either a red or blue stripe and is customized with your logo/slogan. The box stresses how much their business is appreciated by you! A great product for Mortgage Companies, Title Companies, Banks, Realtors and Home Restoration businesses. Displaying a cloud Background with a Daisy and “Have A Great Day!” on the roof. 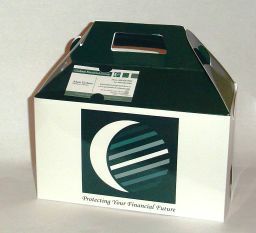 These boxes can be used by most every business to market their products or services. If you’re in the insurance field…what a great way to thank present customers and gain new ones. 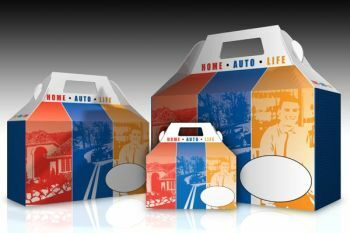 Illustrated with a home (red), a car (blue) and a man (orange) with the words “Home – Auto – Life” on the handle. 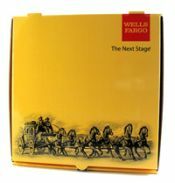 Of course, when personalized with your logo/slogan this really makes the ultimate promotional gift. 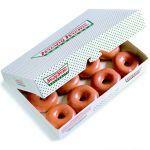 I am looking for 9X13 size donut box. Do you carry this size? I just sent this page to the top coach and consultant in the carpet cleaning industry who is a good friend of mine. He uses “donut delivering” to his referral sources as a referral marketing strategy. He has a big seminar coming up this next month. I suggested that he present his referral strategy to all his cleaners with this box concept. I am interested in the box that is the little white house for real estate. Is this thin or thick cardboard? I don’t have a regular business, I live in a small town above the arctic circle, but don’t get me wrong, I make doughnuts for big corporations like shell oil, conoco, native corporations, us senators and many more. Everything you’re sang about making business connections with doughnuts has rang true for my husband and myself. If my doughnuts aren’t at a meeting, people don’t want to be there.